The basic structure of the hydrophobic retinoid molecule consists of a cyclic end group, a polyene side chain and a polar end group. All trans retinoic acid (ATRA)can induce complete remission in patients with APL, that is the acute promyelocytic leukemia. It's important that this therapy is used in combination with anthracycline-based chemotherapy in order to be effective. Has been clearly shown that the combination of ATRA and chemotherapy gives better survival in newly diagnosed APL than chemotherapy alone because of fewer relapses; more than 90% of patients with newly diagnosed APL can achieve the complete remission and about 75% can be cured by this combination. The RARα (nuclear retinoic acid receptor alpha) controls the expression of specific genes through binding at response elements and interactions with coregulators. The transcription of RARα target genes is controlled by phosphorylation cascades that start with the activation of the p38MAPK/MSK1 pathway by Acid retinoic. 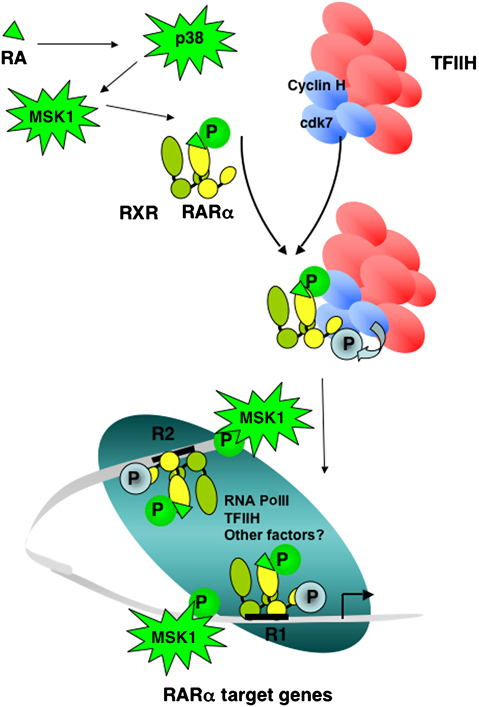 MSK1 phosphorylates RARα in the ligand-binding domain, allowing the binding of TFIIH and thereby phosphorylation of the N-terminal domain by cdk7/cyclin H. So the phosphorylation cascade started by MSK1 controls the RARα target gene activation. Cancer cells characterized by a deregulated p38MAPK/MSK1 pathway, do not respond to RA, outlining the essential contribution of the RA-triggered phosphorylation cascade in RA signalling. P38MAPK interacts with RARα and the suppression of this interaction enhances the therapeutic activity of retinoids in acute myeloid leukemia cells. In fact all-trans retinoic acid (ATRA)is used in the treatment of acute promyelocytic leukemia (APL) and in other types of acute myelogenous leukemia (AML) and inhibition of the genic expression of this protein kinase, p38α, favors the anti-proliferative activity of ATRA and synthetic retinoids. P38α inhibits transactivation of the nuclear retinoic acid receptor, RARα, and the derived protein expressed in the majority of APL cases. Inhibition is the consequence of ligand-independent binding of p38α, which results in stabilization of RARα and PML-RARα via blockade of their constitutive degradation by the proteasome. The inhibitory effect requires a catalytically active p38α and direct physical interaction with RARα and PML-RARα.